Well we made it through another one. I’m not talking about the really terrible year 2009 or the equally terrible decade. No, I’m talking about another holiday season and all that wonderful food we shouldn’t have eaten and all that great wine we shouldn’t have saved for January. So naturally we’re all making plans for dramatic dieting during the next several months. In the vein of trying to provide a service to my readers, here is some information on the waist-line expanding properties of wine. According to data from the U.S. Department of Agriculture, a standard serving (5- ounces) of table wine, red or white, contains 125 calories. By way of comparison, a 12-ounce can of Coca-Cola has 140 calories; a 12-ounce bottle of beer 150 calories; and an 8-ounce glass of whole milk 160 calories. This is an average for wine, since the calorie content will vary with the alcohol and residual sugar content of the wine. Sweet wines having higher calorie counts than dry wines. If you drink sweet white wines, your 5 ounce glass might contain 200 to 250 calories (a Hershey bar contains 210 calories). If you are an Atkins, South Beach or other low carbohydrate diet subscriber, then you don’t really care about all those calories, do you? A lot of experts don’t seem to like these low carbohydrate diets, but I think they reflect a more natural way of eating than most diets, including our usual diets of eating everything we can get our hands on. When we were running around on the savannahs in Africa a million years ago, our diet consisted pretty much of meat and whatever plant material we could find. That’s what our bodies we adapted for. There was no bread or Twinkies or salads for that matter. We grew up on protein and fat. Now I need to carefully climb down from my soap box and get back to the column. Unfortunately, wine is not much more carbohydrate friendly than it is calorie friendly. A 5-ounce serving of dry white table wine contains around 1.25 grams of carbohydrates, a glass of red around 2.5 grams. Yes, you guessed it, sweet wines will have substantially more carbohydrates than dry wines. So if that news isn’t bad enough, alcohol while not a carbohydrate, behaves metabolically a lot like a carbohydrate. So, for the purposes of a low carbohydrate diet, alcohol should be treated as a carbohydrate. There is some good news about wine and our waist line. Wine contains no fat and no cholesterol. I’ll drink to that. As in so many things, moderation is the key. While there is no way around what you drink showing up on your waistline, total abstinence isn’t required. If you want to drink more wine, drink drier red wines rather than sweeter white wines. Also, there’s a tendency to eat more when you’re drinking. Watch how much and what you eat with your wine. But, most important, cut down on the quantity if you are really serious about your weight. At least until the middle of January or so. Given that, try to have as Happy a New Year as you can! I hope you’ve visited my blog at www.virtualwineknow.com. 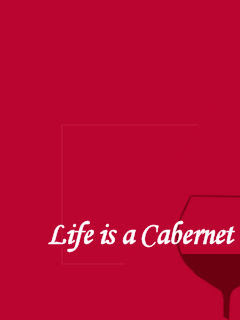 Not only will you find all of the Life is a Cabernet columns there, going all the way back to the beginning of the column (and the Tribune) in 2007, but you will also find near real-time commentary on wines that I discover. Each time I drink a new wine that is worth your knowing about, I post comments about in on my blog. Some of these wines, like the ones below, will find their way into Cellar Notes, but most will only appear in the blog. You can subscribe to the blog via email, so every time I post a new wine, you’ll receive an email about it. Give it a try; there’s also a great Wine Primer that I’ve created from past columns. Comments: A noticeably sweet sparkling wine with notes of peaches and vanilla. It went well with eggs and other holiday breakfast fare. Comments: One of many fine Ridge Zinfandels. Medium body, low tannins, complex flavors.